Steve Dawson is a man set apart from many of his fellow Catholics. In fact, he has been told by several of his fellow Catholics that his methods of evangelization are decidedly non-Catholic. But he feels that he is fulfilling a calling of the Holy Spirit, and returning in a way to the roots of the Church, spreading the Gospel of Jesus Christ on streets all over the United States—and, as of the writing of his new book, Catholic Street Evangelization: Stories of Conversion and Witness, spreading it in six other countries. Dawson founded an apostolate that came to be called St. Paul Street Evangelization (SPSE). Inspired by his own conversion to a deeper and richer expression of his Catholic faith, and his experience as a sidewalk counselor outside an abortion clinic, Dawson felt called to bring the Catholic faith to the streets, to throw open the doors of the churches and go into the world. In just a few short years, this apostolate has grown into hundreds of affiliated groups, spending incalculable hours as witnesses to the Gospel, spreading God’s grace and the beauty of the Truth as far and wide as they can. In his book, published by Ignatius Press, Dawson has written and compiled stories from across the country of the way in which St. Paul Street Evangelization has affected people’s lives, and brought them home to their Mother, the Church. Dawson spoke to Catholic World Report about his new book. CWR: What brought you to tell these stories? Whose idea was it to compile this book? Steve Dawson: When we first started doing St. Paul Street Evangelization in Portland [Oregon], we were really amazed at the power of the Holy Spirit in the conversations we were having. We thought that we were just planting seeds and we wouldn’t see any fruit, and what we found is that the Holy Spirit was showing us a lot of fruit. And we thought to ourselves, “Wow…why aren’t other Catholics doing this?” At the time I didn’t know of any Catholics in Portland who were doing street evangelization. I’d lived in Portland, and in Detroit, and in some other places, and I just didn’t know of any Catholics that were doing this sort of thing. So I thought, well, if we could just tell the story of what we were doing, and start sharing the stories of the encounters that we had, then we could inspire people to do the same thing that we were doing. […] So we got a Facebook page and a Twitter account and, as we did that, people started getting in touch with us from around the country, asking us “How do we do what you are doing? This is a great idea; we’d love to get involved.” From there, it just grew. Secondly, one of the most powerful evangelization tools is personal testimony. So, we recognized this early on: everybody has a story, and people are interested in hearing our own stories. So we thought if we could just write a book that would be a combination of the personal testimonies of our evangelists who are getting involved, along with some of their experiences out on the street, we thought we could continue to encourage other Catholics to do what we were doing, whether that be starting a St. Paul Street Evangelization team or just encouraging other Catholics to share their faith in their own ways. CWR: St. Paul Street Evangelization is an extremely new apostolate, but it has already expanded all over the country in astonishing numbers. Are you surprised by how rapidly it has spread? Dawson: Yes and no, I guess. We knew right from the very beginning that we were on to something, that the Holy Spirit was blessing our efforts, by the amazing conversions that were happening right out on the streets. We were praying with people and they would break down crying, and give their life back to God, or we’d take people to confession, or even have situations where we’d save people’s lives from abortion, things like that. When people would get in touch with us, they’d ask how they could do the same thing in their area and get involved with us. We didn’t have the idea that we would become a big national apostolate; we just wanted to do some street evangelization. But as people started getting in touch with us, they would ask us questions like “How do we do what you’re doing? We need some sort of training,” or “Where do I get pamphlets from? Where do I get rosaries from? Where do I get miraculous medals from? Where do we get a sign from?” So we realized that we had to develop resources for people and that if we had 20 teams of people working together, we could get resources at a better rate, because we could purchase in bulk. So, the reason why we started working together in the first place was so we could save money. CWR: How many SPSE groups are there now? Are you continuing to get requests from prospective groups in new places? Dawson: I think we have over 225 teams. We get new requests every day. Basically, what happens is, somebody will hear about us, whether it be from Catholic media or on Facebook, Twitter, or Catholic radio…they’ll get in touch with us, they might be interested in finding a team in their area, or even in starting a team of their own. When we get a request for information, I pick up the phone and I give them a call, and we talk it through. I’d say we get at least three requests to start a new team per week. We work with them to see if that’s something God’s really asking them to do. But we’re setting up new teams every week, pretty much. CWR: What are some of the encounters that stick out in your memory the most, for better or for worse? Dawson: First let me touch on the “worse” encounters. I’ll say one of the things that was really surprising to us is that we almost never have really bad encounters. I mean, when we first started going out I thought there would be a lot of hostile debates, that people would get angry with us, and really that just doesn’t happen. And maybe it’s because our method is non-confrontational. You know, people picture in their minds street evangelization like a guy standing on a soapbox, preaching out of a bullhorn, yelling at people, telling them they’re going to hell. Of course that kind of preaching gains gawkers: people come and they’ll heckle them. But that’s not what we do. 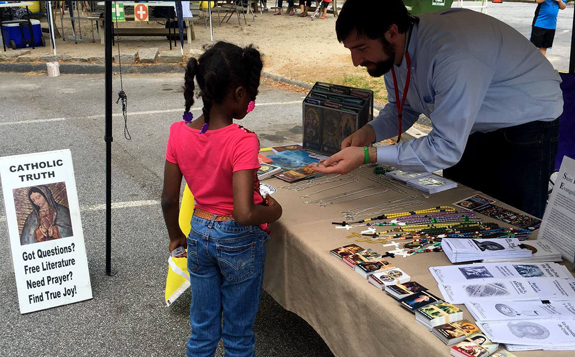 What we do is we just set up somewhere, like with a blanket, or a table, or on a bench or something, and as people walk by we’ll invite them to look at our resources, take a free rosary, that sort of thing. The people, really, who would be most likely to be confrontational or hostile, really they just pass us by. They don’t even stop and talk to us. Mostly it’s only the people who are interested who stop and take a rosary and who engage us in conversation. I’ve only had one or two situations where somebody became quite upset and angry. Literally, I’ve been out thousands of hours doing street evangelization—it’s just very, very rare that we have something very negative that happens. One lady—it was clear that she was from Eastern Europe, and she just started screaming at us, saying the Catholic Church is the reason for all the poverty in the world, we repress women’s rights; she just went on and on about how, if it wasn’t for our stance on contraception…it was bizarre. And we just let her scream at us. And when she was done screaming at us, she stormed away, and that was it. Another time someone flipped us off, but beyond that, really we don’t have stories like that. Positive stories happen all the time. In fact, there’s never a day that I go out and do evangelization when I just walk away from there and say “Wow, that was a complete waste of time; we didn’t have a single positive encounter.” Never. Not once have I gone out and not had at least one positive encounter. I have literally thousands of stories. This one’s in the book. There was a young man—this was in Portland—he came up to us, he had tattoos all over his body, and piercings, and he wanted a rosary and we started talking. And he was hurting—you could tell he was kind of distant. And I said, “Are you Catholic?” and he said “Well, I used to be, but, you know, I don’t think I could be considered Catholic anymore, I haven’t gone to Mass in decades.” His parents had him baptized, but his dad ended up in prison, his mom pretty much abandoned him, and so he was just living the hard life. For whatever reason we started talking about death and judgment, and it turns out that he was convinced that if he died that day, he would go to hell. And I just gave him the good news. First of all I gave him my own personal testimony, that I was very far from God in my own life, and I know that if I had died during those years that I would have gone to hell, too, but God loves us—he doesn’t want us to go to hell. He wants us to repent and turn to him. And I told him how God would forgive him. And because he was Catholic all he needed to do was get to confession. I gave my information, told him where my church was, and he showed up at church. He went to confession, and started going to Mass, and Stations of the Cross, and all that sort of thing. So it was a pretty cool experience. Just a few weeks ago I was in Austin and, same type of thing: there was a young man, he didn’t go to Mass, and he was Catholic, and I just told him about my own personal testimony, my story, and I asked him if I could give him one good reason why I choose to go to Mass every week. And I did. I explained to him why it’s important to go to Mass and to take the faith seriously. A few minutes into the conversation he started crying. God convicted his heart. And about 20 minutes later there was a local church that was doing confessions right then—we got him in line, and he went to confession, and he reached out to me and said he’s starting over. His new life. That sort of thing happens often. CWR: Have you had the opportunity to join SPSE groups in other cities apart from Portland? If so, what has that been like? How do the different parts of the country differ? Dawson: Each region is going to be a little bit different in several different ways. For example, the type of people that you’re going to run into in the Bible Belt are different than the type of people that you’re going to run into in a heavily Catholic area. In the Bible Belt you’re going to have to have a greater knowledge of Protestant-Catholic apologetics, for example. Or, in a place like Portland—[laughs] I mean, it’s a really unchurched area—a high percentage of the people you’re speaking to have no religious affiliation, so it’s going to be like that. I have been involved in different cities. I’ve been involved in Portland, I’ve been involved in Detroit, we’re in Bloomington, Indiana right now, which is where our headquarters is. And then I visit the teams. So, I’ve done evangelization in San Diego, and Austin, and Dallas, and on the east coast in Maryland, and Washington, DC, and everywhere in between, St. Louis, Florida—I go out with the teams. The common thread is that most people we talk to, wherever we are in the country, are far from God. Even high-populated Catholic areas, most of the people we speak to are not taking the faith seriously, they don’t go to Mass regularly—most people, there are exceptions. But throughout the country, I’ve never been in a region where I feel like, “All these people we’re talking to, they’re good. Their relationship with God, generally, is just really good here.” And I think that has a lot to do with the secularization of our culture, and really that’s the reason why we’ve been called to the New Evangelization. We need to re-evangelize our culture. CWR: What do you hope will come from releasing these accounts together in a book like this? Dawson: My big hope is to be a contributing factor in the changing of the perceptions of Catholic that evangelization does not look like what we’re doing. That it’s not public, it’s not out there in the streets, or door-to-door—that Catholics don’t do public evangelization. We have had Catholics who tell us, “Oh no, that’s Protestant. That’s not how Catholics evangelize. Catholics evangelize by working in soup kitchens and that sort of thing. What you’re doing is not Catholic.” So my hope is that we can inspire Catholics to step outside of their comfort zones, to change the mentality that evangelization looks a certain way, and kind of get back to basics. I would consider basics of evangelization to be sharing your faith publicly. Those are the basics. That’s what the Church did. I also hope to give people courage. I’ve already had people contacting me from around the country, people who have read our books, and they’ve said that they’ve gained a new courage to share their faith with other people. They thought that evangelization was all about apologetics, and because they weren’t professional apologists they were just too uncomfortable to share their faith with somebody. And we want to make it clear that apologetics can be useful in evangelization, but they’re not primarily important. A person who doesn’t know any apologetics at all can be an awesome, amazing evangelist.